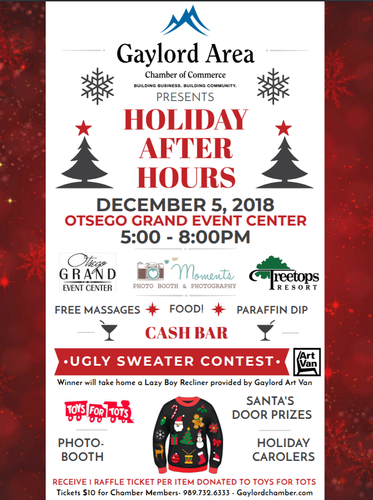 The Gaylord Area Chamber of Commerce along with sponsors; the Otsego Grand Event Center, Treetops Resort and Moments Photo-Booth & Photography are proud to present its largest Business After Hours of the year, Holiday After Hours. The event is scheduled to take place at the Otsego Grand Event Center from 5:00 – 8:00pm. This year’s event will feature an “Ugly Sweater Contest” where the grand prize winner with the most hideous holiday outfit will take home a Lazy Boy recliner donated by Gaylord Art Van! Guests can look forward to catching up with associates and friends while sampling delicious appetizers provided by the Otsego Grand. On your way to the photo-booth for a festive portrait, don’t forget to drop off your new, unwrapped items at the Toys for Tots booth. For every item you donate you receive a raffle ticket that will enter you into a prize drawing. Treetops Resort & Spa will be offering complimentary massages and paraffin dips. Stop at the bar and grab our featured cocktail for the evening, “Jingle Juice” and make your way over to the Treetops station for some well-deserved pampering! Other exciting features include holiday carolers and door prizes. The event is open to the public; admission is just $10.00 for Chamber members and $15.00 for non-members. Purchase your ticket today by calling 989.732.6333, emailing Rebecca@gaylordchamber.com or easily register online by visiting our website at www.gaylordchamber.com/business-after-hours.